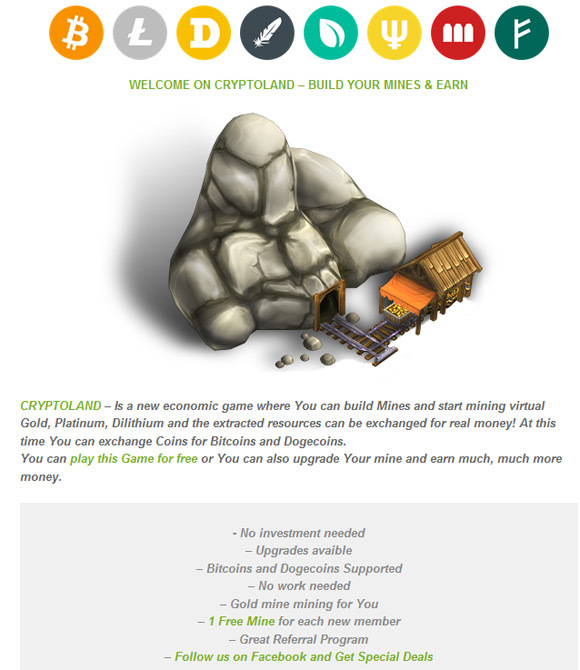 Cryptoland is a web-based game where you run a Gold Mine and mines for other valuable resources and sell the mined virtual resources for Bitcoin thus earning coins in the process. It is a fun game with a simple concept, similar in terms of idea to the game Ore-Mine, but with a slightly different implementation. In the game you can start your Gold mining operation absolutely free, after registering you will get one Gold Mine that will start working for you and earning you coins, there is no need to invest anything – you can start and play the game for free. Of course upgrades to your Gold Mine are available and you can also build other mines for resources such as Coal, Platinum, Uranium and Dilithium for example. Besides mining there are other things you can do to get more Gold that you can then sell for Bitcoins (1 unit of Gold is sold for 11 Coins and is equal to 11 satoshi), you can complete offers, visit websites, complete offers or do tasks. You need to collect at least 50000 Coins in order to be able to withdraw them in Bitcoins, the minimum for Dogecoin withdraw is 65000 Coins. The basic Gold mine that you get for free when you start the game will produce 15 Gold per day, not that much for a start, but then again not bad for something you get completely free to start playing with. You can increase the daily production of mined materials (Gold, Platinum, Dilithium) by building another mine, at this time you can run up 25 mines of each kind. 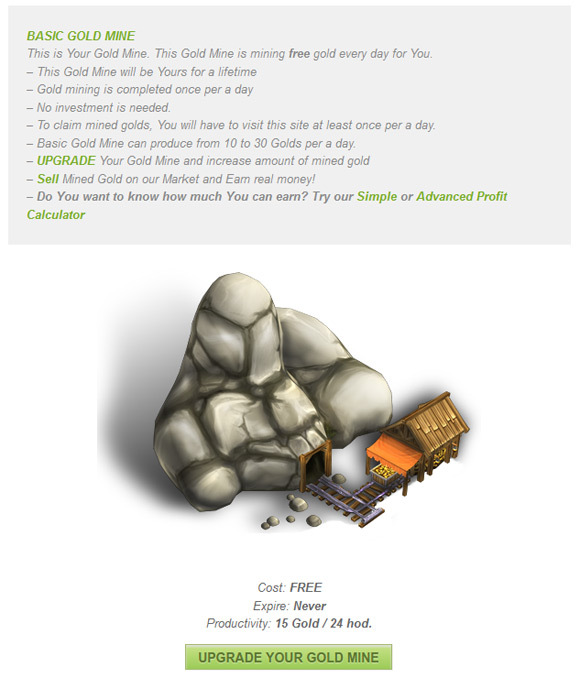 The basic Gold mine will be your for lifetime, if you are active at least once per 30 days. Standard contract for the others mines are valid for 180 days and flexible contracts can be valid between 60 and 365 days. 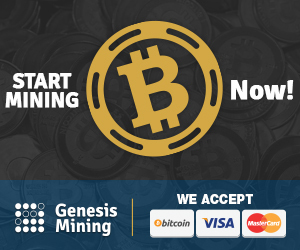 An upgraded Gold mine will mine 1000 Gold per day and you can get a mining contract purchasing if by PayPal, BTC, LTC, BLK, DOGE, DRK, MEC, NMC, PPC or XPM crypto coins. If it sounds interesting you can start up your free Gold mine operation and try out the game in order to build a larger mining operation that can get you actual Bitcoins. 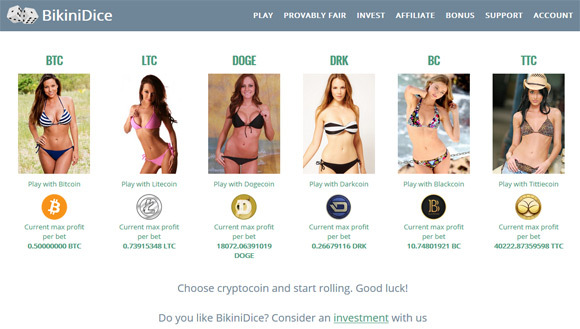 BikiniDice is a web-based dice game where you can play with multiple crypto currencies, all you have to do is choose the cryptocoin and start rolling the dice. The game comes with photos of beautiful girls in bikini as an extra feature to make it even nicer for boys playing, though you can also play a classic dice game if you with to do so. Multiple crypto currencies are supported and can be used, so not only Bitcoin (BTC), but also Litecoin (LTC), Dogecoin (DOGE), Darkcoin (DRK), Blackcoin (BC) and even Tittiecoin (TTC). The website does require you to go through a quick and easy registration process that requires only an email address and password before you can start playing. 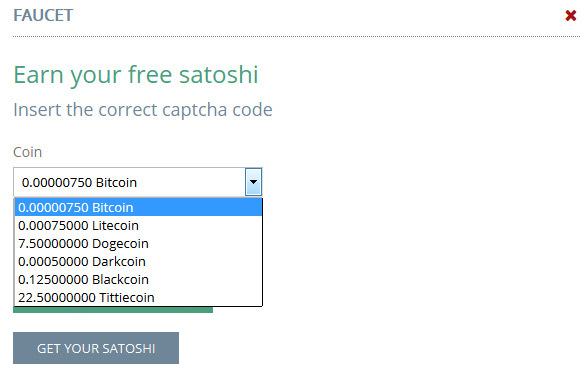 So it is pretty much anonymous dice game with crypto currencies such as Bitcoin. BikiniDice has a 1% house edge and is a provably fair dice game website with Bitcoin and other crypto currencies that are supported by the service. 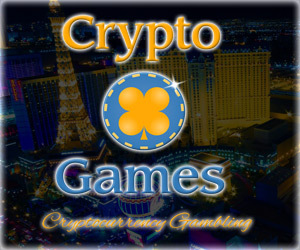 To get started you don’t have to do anything, you can claim some free satoshi (750) or some other coins from the Bonus Faucet that the service provides and start playing. Of course you can also invest some coins yourself sending them to your wallet address in the website and play with some more coins or larger bets and if lucky to win more. If playing with BTC the minimum bet is just 1 stoshi and as usual with dice games you control the risk by choosing the expected payout if you manage to win a game. You can play single bets or take advantage of the available automatic betting feature to execute multiple bets faster and test your luck or maybe some dice betting strategy that you have thought of. All we can do no is to with you luck and have fun with the beautiful girls in bikini at this crypto dice game.